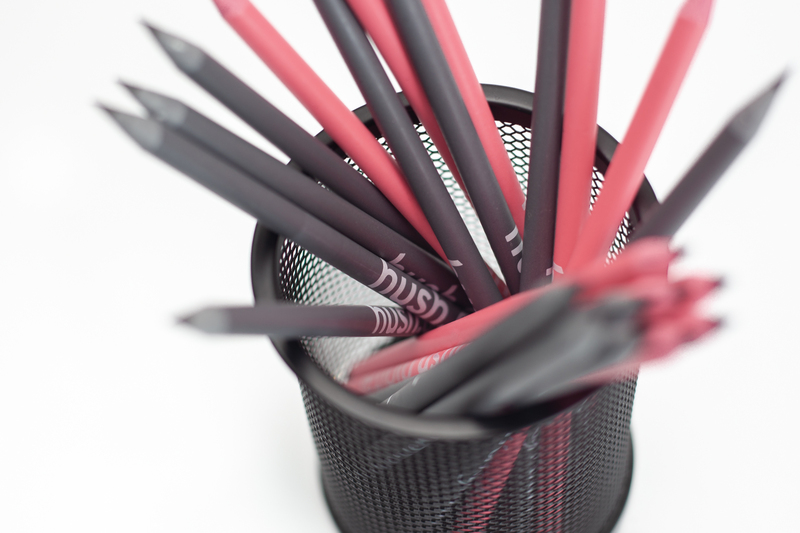 We are so excited to finally unveil our new brand, Hush Digital. This is something we have wanted to do for a long time now, and a huge amount of hard work from the whole team has gone into making our dreams a reality. We officially announced our new name on the 28th March 2019, launching our new website and branding across our social media platforms for the world to see. This was swiftly followed by our launch party in the stunning surroundings of the Fig House, Middleton Lodge, where a number of our wonderful clients, suppliers, friends and family were able to join us to celebrate (to check out all the pics, head over to our Instagram or Facebook pages). We’ve been around for a lot longer than we look! Initially established way back in 1997 under a previous name, we have a huge amount of heritage which has helped us to get to where we are today. We went through our first rebrand back in 2004, when Geonet Solutions came to fruition. There were some big changes and growth under this name, including a change of ownership in 2010, a new Director in 2014 and new offices in 2016. It served us well, but it got to the point where who we were, what we did and how we did it had outgrown our brand. That’s when we first decided a rebrand was going to have to be on the horizon for us. We needed to modernise our name and our brand to better represent us as a company. 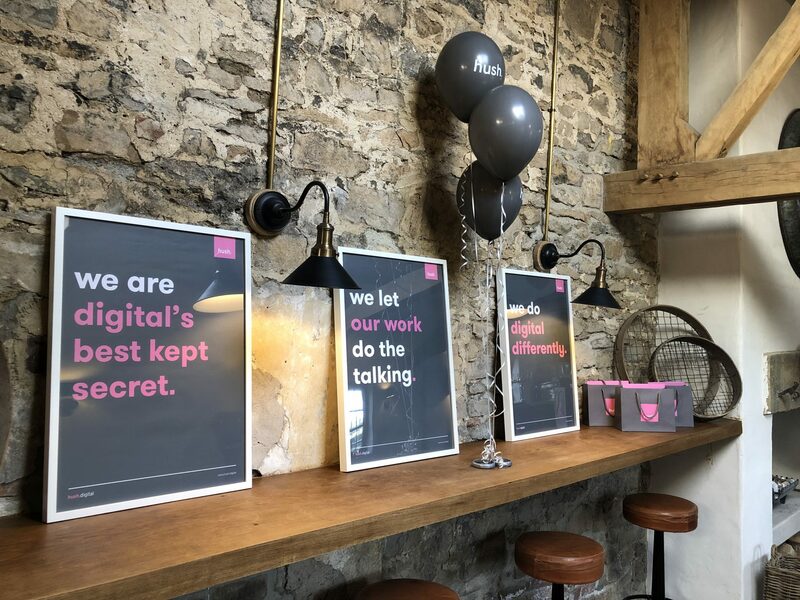 We’d been referred to a number of times as ‘digital’s best kept secret’ because we have some fantastic clients and the quality of our service and end product is second to none, but not everyone had heard of us because we were too busy shouting about our customers rather than ourselves. We loved this description and it helped us form Hush, which also fit with other elements of our ethos, because we let our work do the talking. There are plenty of digital agencies out there that say they are good, but we are big believers in delivering results, not promises, and we always direct prospects to our portfolio of finished projects for happy customers so they can see what we are truly capable of. Being branding and digital experts, the pressure was very much on for us to execute this brilliantly. We had many comments along the lines of ‘we can’t wait to see how the experts do it!’ which both spurred us on and added a little pressure, but that’s very much the environment that the HushBots thrive in. Once we had the name, we developed full brand guidelines for all of our design and marketing activities to then follow, keeping everything streamlined and ‘on brand’. When we renovated our current office building, we kept everything grey 1) it looked ace and 2) we just knew this would be incorporated into our new look one day. This eventually helped us shape ‘HUSH GREY’ and ‘HUSH LT GREY’. It was also important for us to keep some elements of Geonet’s brand structure within Hush’s branding, as it was important to both us and our clients that there was some continuity between the two brands. We, therefore, kept highlights of the eye-catching pastel pink and transformed the much-loved GeoBots into the HushBots. 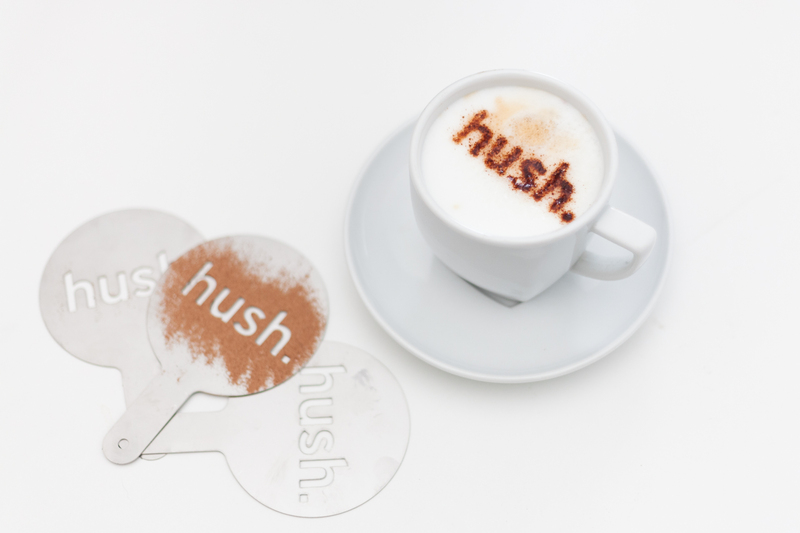 We are all about the details here at Hush, so as well as all the usual collateral essentials from brochures to business cards, we also added our refreshed branding to some more unique elements, including our coffee stencils (thanks to SSC Laser! ), recycled pencils and ‘hello’ greetings cards. So now we’ve modernised our name and branding to better match who we are, what we do and how we do it, it’s full steam ahead for Hush Digital. We’ve got big goals and ambitious aims for the rest of 2019 and beyond, and we cannot wait for you all to join us on our exciting journey as we take the digital world by storm and continue to deliver the very best for our clients. Do you want to do digital differently with us? We’d love to hear from you. 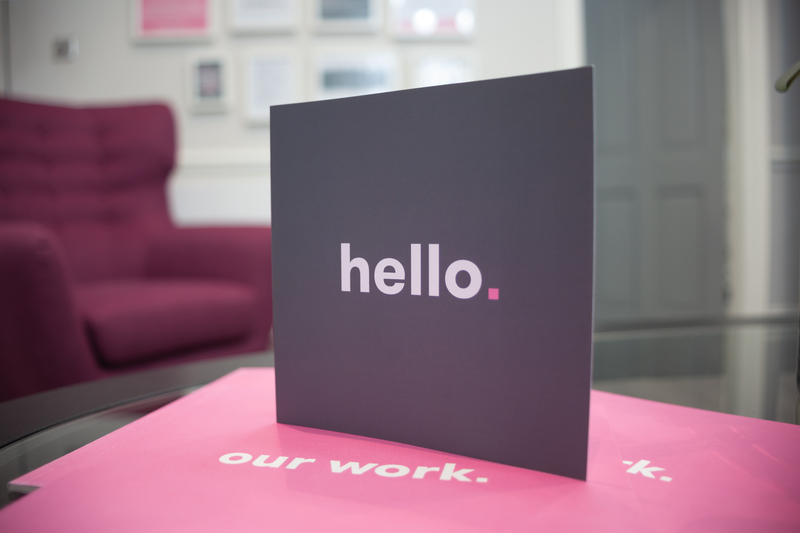 Drop us a note at hello@hush.digital or give us a bell on 01325 361 729 and let’s see what we can do.